Our Hexagon Ottoman’s are commercial grade and our ottomans are cost-effective, functional, and attractive options that can be used in a number of different situations. Modular office furniture makes it easy to configure and even easier to reconfigure for your needs. 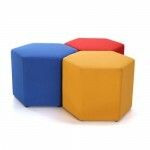 This Hexagon Ottoman is a colourful and stylish addition to any business. Fit for sitting or as any ottoman even as a table or footrest. This honeycomb-shaped ottoman becomes more impactful with each additional ottoman added. Nature inspired office furniture is on trend. The hexagon ottoman is functional, modern and affordable! Ask Our Consultants for a colour consultation! Click here!